It is tough to choose what work to include in your fashion portfolio. In all the research I did for this book and phone calls I had with designers like you to make sure it was the best possible, the biggest hangup you have is about choosing what work to include. As fashion designers, we love our work. It’s hard to be critical, to put things on the chopping block, and to exclude work that we have a personal attachment to. But this is also part of our job. We have to know where to cull down, when to drop certain styles, and what options are truly the best. You need to do some accurate self assessment, trust your judgment and have confidence that you are choosing the right projects. Like we’ve talked about before, you do this with your design work, your fashion portfolio is no different. You just need to look at it through a more critical and less personal lense. Now, I know that’s not the answer you wanted, which is why I will share some specific strategies to help you out. Remember, your portfolio is about quality, not quantity. It’s not about including every design you’ve ever done, your favorite work, stuff that got great press in Vogue or at NYFW, or every piece you won an award for. Congrats on the press and accolades, I am proud and you should be too, but it doesn’t mean it necessarily belongs in your portfolio. It’s about including the designs that best speak to the brands you are applying to work for. Is it relevant to them? Will they look at it and think “ah, yes, she has a great POV (point of view) and gets our aesthetic”? That is your litmus test. That is your benchmark. It is the Portfolio Golden Rule! Everything in your book should pass it (with an exception for fashion designers who are new to the industry / changing categories…more on that later). Now, while there is no magic number of how many projects to include, a good starting point is 3-5 projects. If you’re younger in your career, 2 may be enough. If you’ve been doing this forever and really have 6 or 7 that are fantastic, speak to the brand and show your strengths as a fashion designer, include 6 or 7. It’s up to you to decide on how many pages each project gets, but again this is more about giving a good overview and showing the quality of your work, not about the quantity. A good range is 2-4 pages per project, depending on the size of the project and the size of your (physical) book. Whatever you do, include the projects (and pages!) because they warrant inclusion. Because they’re good enough to be included. Because you feel confident including them. And if you’re unsure, strengthen your backbone and build up the courage and confidence to make a decision (or get some industry feedback…more on that later). I will reiterate: As a fashion designer, this is your job. You got this, and you know more than you think. So, sit up tall and make the call. Now, globally speaking, your physical book will most likely have more work examples than what you send in an email / online application. Your email / online / digital fashion portfolio is only going to show the best of the best for the brand you’re sending it to. There’s a good chance they’re receiving hundreds of applications…so if you send 9 projects and only 2 of them really resonate, they’ll get distracted by all the irrelevant clutter before they even realize that 2 of them match their aesthetic. So just send the 2-3 that speak to them, and save the others for an in person conversation. Remember, they will most likely only glance at your work for a few seconds. Catch their attention fast and in a succinct way. Once you’re in an interview, gauge their interest and the questions they ask to determine what else to show from your past work. If something is totally irrelevant (ie footwear for a denim interview), pull it from your book before you go. No need to bring stuff that’s really off par…but better to be prepared with a few extra projects in your “back pocket” that you can speak to…even if they aren’t a 100% match. You may have done a collection of missy woven tops for missy, and are now on an interview for missy active. Your woven missy tops will show you know the market, even though it’s a different category. Again, use your best judgment as a fashion designer. In my Successful Fashion Freelancer coaching program, I talk about the idea of The Process Portfolio. Simply put, it means that your portfolio should show the process you go through as a fashion designer. Brands not only want to see the finished designs you come up with, they want to see where your ideas come from. Where does your POV (point of view) come from? Now, I’m going to be 100% honest when I say that I realize a lot of times in fashion, ideas are copied. And you may do a lot of work that is “inspired” by other brands or what you see on the runway. I have done it for a lot of brands I’ve worked with, and I know a lot of you have too. So, let’s look at two different scenarios that are on opposite ends of the spectrum. You may fall somewhere in the middle of these two, so evaluate and adjust accordingly. You are one of the few (lucky?) fashion designers who actually gets to create from scratch and execute your vision. You collect tears from Architectural Digest and photos from nature and collage them into a beautiful moodboard. Yes, you are following the trends and you know what’s in right now, so of course that’s incorporated into your vision. But you also pull a lot from other industries and what’s around you. Sharp angles from modern buildings are translated into style lines for an asymmetrical dress. The fine lines from a flowers petals are converted into abstract motifs for a repeating pattern. Your sketchbook is full of drawings and magazine tears and doodles that magically turn into finished garments. It’s the fashion designer’s dream. You are one of (most) fashion designers who is given direction (from executives or buyers or sales people) to “make it like this” as they hand you a sample garment or show you a picture. It happens. Sketch a flat in Illustrator and assemble tech pack. Send tech pack and “inspirational” garment to factory. A lot of my work leans closer to scenario two than one, and I won’t lie that for fashion portfolio purposes, sometimes I’ve worked backwards to fill in the “process” part after finished garments were created. I’ve made the moodboards and color inspo a little prettier than they were for the original project. Sometimes when we’re up against tight deadlines and don’t need to share our work in big meetings with fancy presentations, we don’t always have time to make beautiful moodboards. And sometimes, the process doesn’t even begin with moodboards. Maybe it begins with fabric. Maybe it begins with a photo of a garment. Maybe (like we just discussed) it begins with a finished garment that our boss or clients wants us to just get made using their logo. So what do you do for your fashion portfolio? Some people may disagree with this statement or find it controversial. But I’m going to say it anyway…because I KNOW FOR A FACT I’m not the only one who’s done it. You create the “process” and ideation after the designs are done. So, you work backwards. No one’s going to know, and you’re not the only one to do it. Promise. So, what exactly should The Process Portfolio include? Before you get overwhelmed by the list I’m about to share, first know that NOT everything is required. Depending on your strengths, you may have more of one thing (ie hand sketches vs tech sketches) than another. But know there’s no perfect science (remember what I said about this being an art?). The inspiration part of your fashion portfolio is non-optional, even if it means you have to create it after the fact like we talked about before. At the very least, you should have a collage of inspiration. This may be just for the product + color, or may include other inspiration / collages for things like trims and prints if that was part of the work as well. Color, silhouette, and perhaps prints (leopard). This is a great “general” inspiration board for a collection and could be sufficient on its own. Color, silhouette, and perhaps prints (feather / ombre). This is a great “general” inspiration board for a collection and could be sufficient on its own. This paints a clear picture of organic and neutral trims / findings. Color, prints (abstract / geo). This is a great inspiration board for textile designers, or for fashion designers if combined with another board that conveyed the same color palette + silhouette inspiration. Moodboards and inspiration are not a one size fits all. Yours may be for any combination of color, silhouette, print, trims, etc, and you may have more than one board. I’ll remind you! It’s an art, not a science. Whatever your inspiration includes, here’s a great trick you can use to really stand out when they see your fashion portfolio. First, let’s be honest that we all look at the competition for inspiration. Brands know this, and when you’re applying for a job or pitching for freelance work, you want to show them that that you’re looking at the right competition. If you’re not? You better figure it out who the competition is and be familiar with their current assortments before interviewing…because you will be asked who you’re watching and what your opinion is of their product. Inspiration also comes from other places, I get that. Your moodboards will also include non-fashion related photos like nature or architecture. But for most brands – high fashion perhaps being an exception – competition is part of the inspiration process. Now, I know for some fashion designers (especially those in school or new to the industry), the inspiration process is really long and you have a lot of material. The truth is, in real life, tight deadlines don’t allow for long drawn out research and ideation phases. Here’s my best answer: enough that it shows how your brain processed getting from one idea to the finished product, but not so much that your book feels like just a giant collage of inspiration. In the real life design world, we’re not making moodboards that are movie poster size. I know you do them in school, but that is not reality. Keep your inspiration (roughly) around 15-25% of the entire project. So, in a very cut and dry situation, if your project was 4 pages, 1 page of inspo would be sufficient. If you ask me, this stuff is more optional than required. I don’t sketch by hand, so I don’t include this kind of stuff. My fashion portfolio skips straight from moodboards to fashion flats. If you do hand sketches or have sketchbook pages with ideas, include them. The can be rough and done in pencil on scrap paper with barely legible callouts. If they show your process, include them. If this isn’t you, then skip it and move on . In 2017, I chatted with a design director at Anthropologie and she told me they do all their sketches by hand and hardly use Illustrator (#mindblown and #whaaaaatttt?!). So depending on your category or what brands you’re talking to, this may be required. Only include these if they look really good. If your illustrations are mediocre…or you just don’t do them at all (most of us don’t because there simply isn’t time), then skip this and move on. But if you happen to have some illustrations and they’re really good, include them. Again, I’d really think about what category you’re going after to decide if this makes sense. Illustrations may be more relevant if you’re working for high end brand than if you’re designing for Walmart or Costco. Required. REQUIRED. REQUIRED! Pretty much every brand (I guess except at Anthropologie…which is super bizarro to me and a total outlier) wants to see your CAD work to know you can sketch digitally. You must show you can create accurate flats with correct details (stitching, trims, where is there fullness, what kind of pleats, etc) that can be read and interpreted by vendors or buyers. These are not beautiful fashion illustrations, but rather should accurately convey the design so it can easily be interpreted. Your decision about how much of this to include is up to you. I don’t think you need to have a ton (if any) of these front and center on your digital fashion portfolio (website or PDF). But when applying for jobs, think carefully about how relevant this skill may be to the brand. In talking with loads of hiring managers – in fashion and beyond – it’s unbelievable the number of applications / emails they receive that are clearly copy and paste. I promise, if you take the extra time to personalize your communication and just show them you are paying attention, you will already be in the top 10-20% of candidates. Yes, it can be as simple as that. And yes, it takes a little more work. But how badly do you want the opportunity? If it’s a large brand and roles are very segmented (ie your job may really only be design, and tech designers / product developers will do all the tech stuff), it’s going to be less relevant. Again, this is a case by case scenario and use your best judgment based on the job to decide what you include or not . An exception to this is for entry level / recent grads. Most of the work you’ll do for the first few years is technical / spec work (even if you’re in a “design assistant” position), so it’s more important to include this work when you’re starting out. Covered in detail in Chapter 7, Starting Out as a Recent Grad or Entry Level Fashion Designer. Now, if you do want to show some tech work, it’s not necessary to include entire completed tech packs, but it can be good to show a few tech / detail sketches. If you know how (and you probably should) to create complete tech packs, it’s a great idea to bring a few examples to an interview (just have them printed out and in a separate folder you can share). But unless you’re a technical designer (which we’ll talk about later), you don’t need to include full blown tech packs in your main (digital or printed) fashion portfolio. These are nice to have but not required. I know it’s not always possible to get your hands on them, or perhaps some of the best designs you did never made it into production (it happens to everyone). If you can get them, great. If not, don’t panic. But whatever you do, make sure they’re professional. Yes, that’s a very subjective term, but here’s what I mean. We all know what DIY photography of a handmade garment looks like. This works for Etsy (where I found these examples), but they do not belong in your portfolio. Don’t include blurry photos someone took with their vintage flip phone. If this is all you have, leave them out. They’re going to do more harm than good. If you have photos that look “good enough”, include them. What does “good enough” mean? Well, you’re a fashion designer, so I’ll leave that up to your judgment. But here’s the cool thing: they don’t actually have to be “professional”… With the fancy modern smartphones that most of us now have access to, you can do wonders if you have some physical samples or even just fabric swatches on hand. 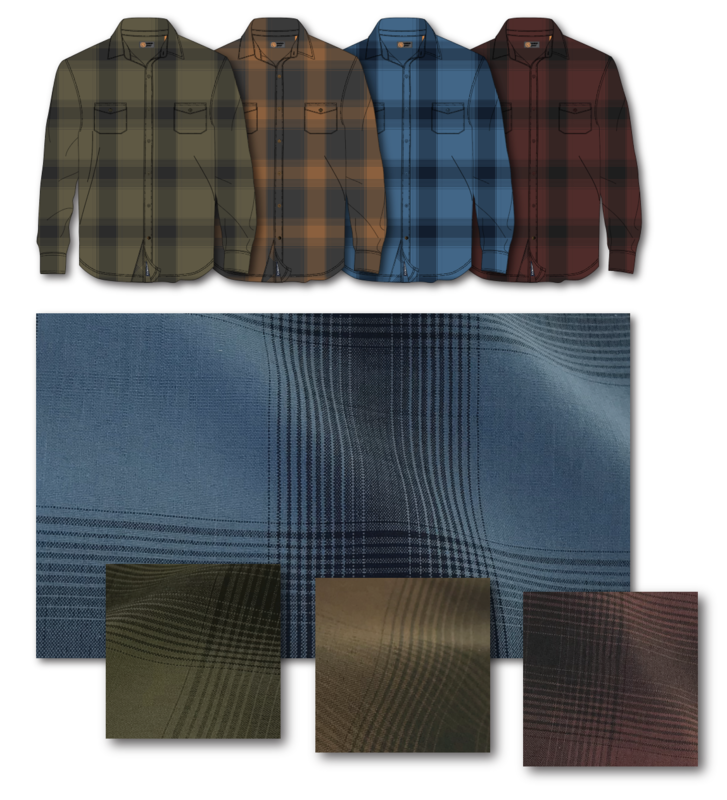 Here are some examples of pics I took with my iPhone when I only had a fabric submit (I mocked up a few different colors of the fabric in Photoshop). It’s much better to show this than just the fashion flat. If you haven’t noticed a trend in my photos, I’ll point it out to you. It’s much easier to DIY close ups photos of a design or fabric than to try and capture the entire garment or use a model. The best solution I’ve come up with over the years is to shoot in natural light (outside) in the shade, put a few soft ripples in the fabric and come in at an angle to add some depth of field. Again, if you don’t have or can’t get finished photos of your work, don’t panic. Ideally you’d like to have some for at least one project, but not having these isn’t a total deal killer. We’ve already covered a lot of this in other sections, but so many of you had really specific questions around this topic I wanted to make sure to address all of them. What if you’ve designed huge collections of 14-16 pieces and aren’t sure if you need to include every piece? What if you have a plethora of work that includes recent projects for your current employer, various freelance projects over the years, designs from your own “little” fashion brand, or self directed / test projects? Again, use your best judgment based on what will resonate with the brands you’re talking to. That said, there is balance of showing your aesthetic as a fashion designer and showing that you’ve done designs that have actually been made. It shows you understand the process from start to finish, not just how to sketch beautiful garments. Choose a happy medium of what best speaks to the brand and what went into production. It will show you have the right eye and understand the lifecycle of design. Honestly, I would follow the order outlined above, which is the “logical” order that things would happen. As we already discussed, they don’t always happen in this order, but for portfolio purposes, this order makes the most sense . Your portfolio doesn’t have to be a structured order of page 1: inspiration, page 2: flats, etc. 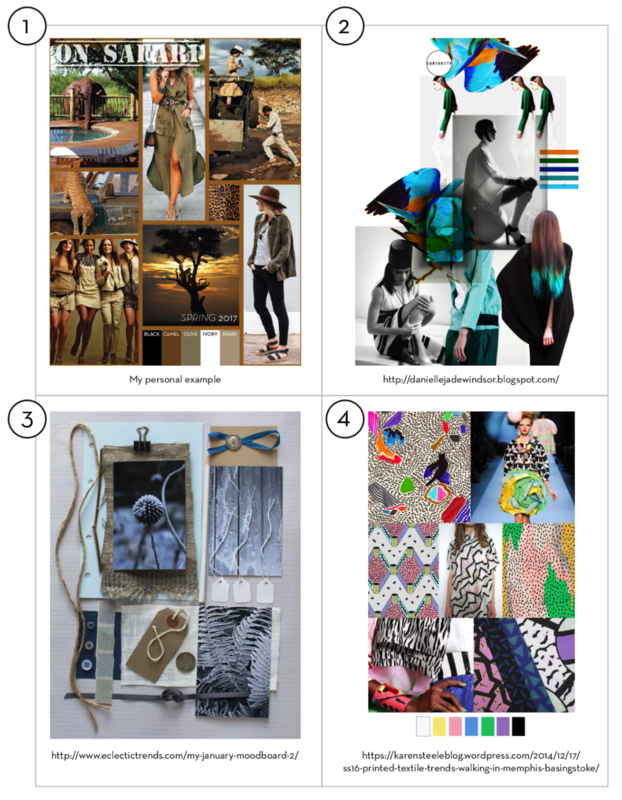 There can be a “collage” like layout to your portfolio just like your moodboards. In the examples section, we’ll look at how a few designers have done this. If you don’t have ALL of these pieces, don’t worry about it. If you’re stronger in some areas than others? Then include more or less accordingly. Make sure you have at least one “page”, but any more than 3 is probably overkill. The only time you’d have up to three is if you need additional pages for things like trims / prints etc as relevant. Only include these if they’re really good. They can be digital or hand, but since most brands don’t require you to do these as part of your job, only include them if they enhance your presentation. Since you (most likely) already know that Illustrator proficiency is required for 99% of fashion design jobs, AI flats are non-optional. Make sure they include accurate details, construction, etc. 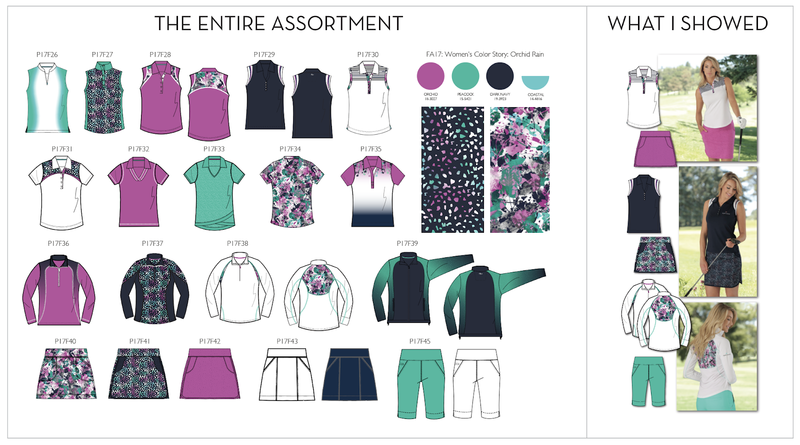 This isn’t just to show you know how to sketch a black and white outlined garment in Illustrator, but that you understand how to communicate the design to a factory / buyers. Stitching, closures, realistic frills (pleats, fullness, ruffles, etc) should be included, and they should be drawn to accurate proportion. This is not a 9-heads sketch, it’s a proportionate sketch that conveys the design. Nice to have, but not required. If you have samples and can snap a few close up or detail shots like the examples we already looked at, that’s great. If you handmade the garments (for school work, self directed project, or your own fashion brand), only include photos if 1) the finished garments look professional and not handmade and 2) photos look professional. No offense, but to put it bluntly, no brand wants to see photos of your friend wearing a handmade dress modeling in your backyard. You’re better off leaving these out and just showing moodboards + flats + other collateral. Again, depending on the category / type of brand you want to work for, sketchbooks / hand sketches may or may not be that important. In my markets (golf / active), they’ve been much less relevant, but more fashion forward brands may require this. Again, if you’re a student / recent grad / entry level, chances are a lot of the work you’ll be doing is tech packs, and the “fun” design stuff will be given to more senior staff. So while you will want to include your design work, it can be equally important to show a finished tech pack or two as part of the project. This speaks to the brand directly to tell them that “you know how to do tech packs”. The biggest mistake fashion designers make is showing each part of the process separately. Well, as we’ve discussed with The Process Portfolio, it’s best to show the evolution of each project from start to finish. As a brand looking through this, there is a big disconnect between all of this work. Other than tech packs, which arguably can be shown as their own “thing” (more on that in a sec), brands want to see what moodboards led to what flats led to what finished garment (product photos if available). They want to see the flow of where things started and where they ended up. They want to see THE PROCESS PORTFOLIO! So show them THE PROCESS PORTFOLIO! Ok, but what about the “tech packs shown as their own ‘thing’”? How does that work? Where does that fit into the “process” part of the fashion portfolio? This is the one section I think can stand alone for a few reasons. It’s not that important to show this as part of the process. It doesn’t really show what your thought process is as a fashion designer, which is one of the main goals of your portfolios. An example tech pack or two shows a brand that you can do tech packs. If they see a good representation of this from you, then that’s sufficient. It’s not so much about connecting that tech pack to the design, but that you understand and know how to put together this document. You may not be able to show actual tech packs as this may be considered proprietary information. As a result, your tech pack examples may be self-generated just to show you know how to do them. Go to Chapter 6: Can You Include Client / Company Work in Your Fashion Portfolio?